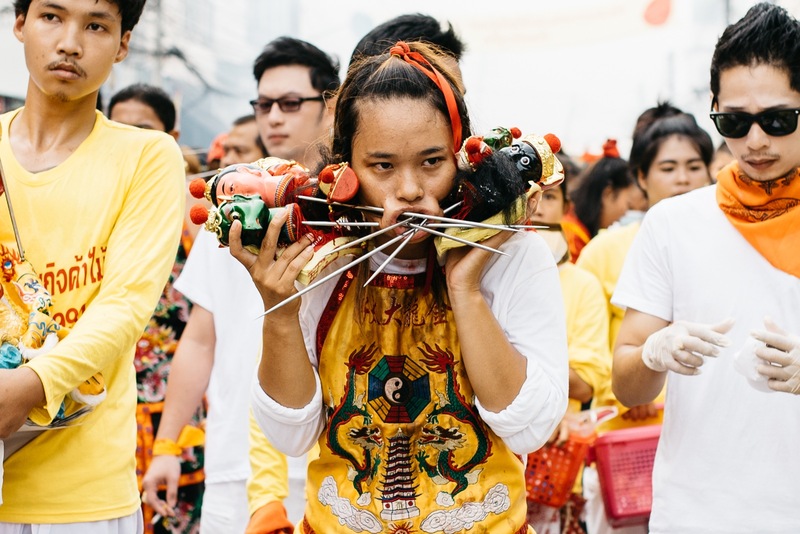 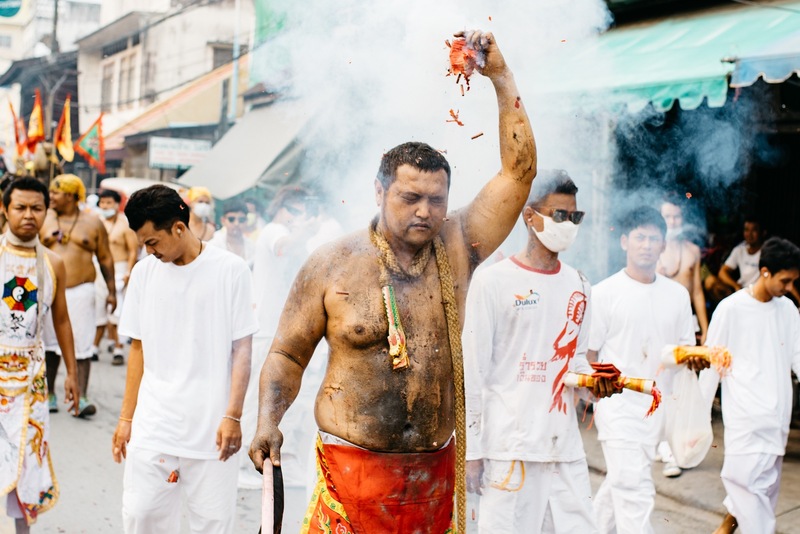 For nine days every autumn, Thai people believe they get possessed by Chinese gods. 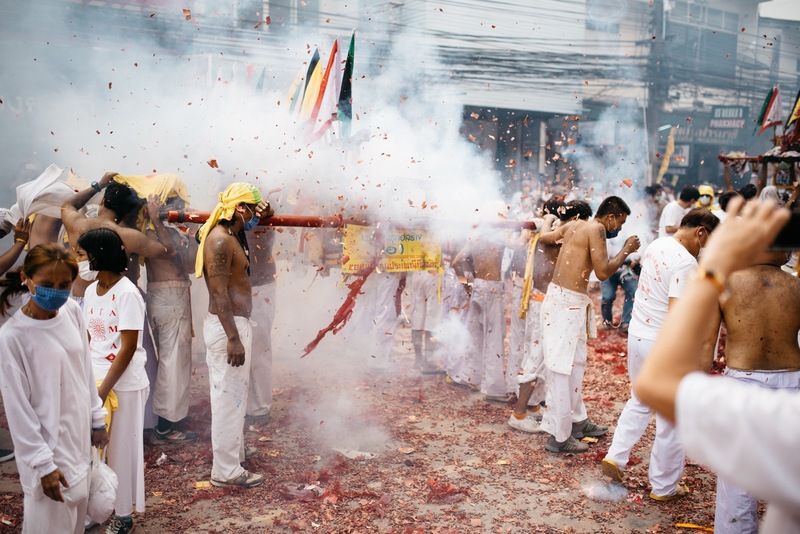 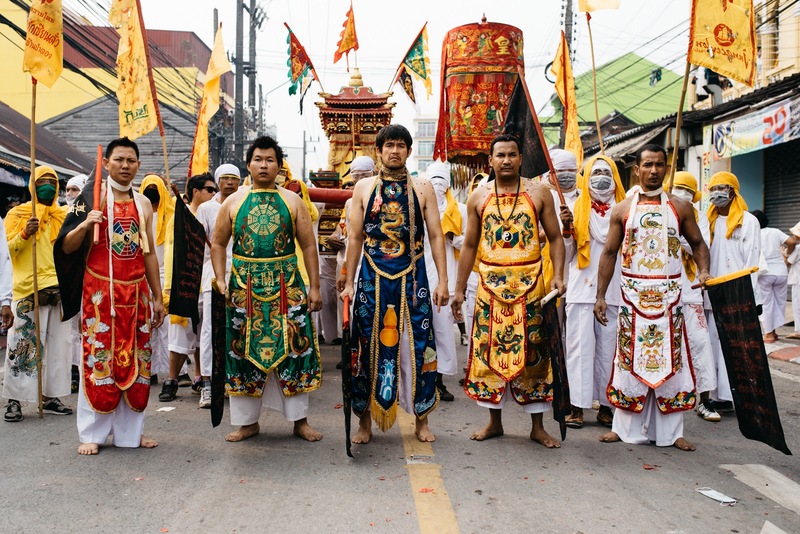 During what is known as the Vegetarian Festival , citizens act as "spirit mediums," locally known as mah song, and pierce their bodies, cut their tongues and foreheads, and hit their backs with sharp axes, blades and spiked balls to invite the gods to enter and possess them while in a trance brought on by the ritual piercing, flaying, and mutilation. 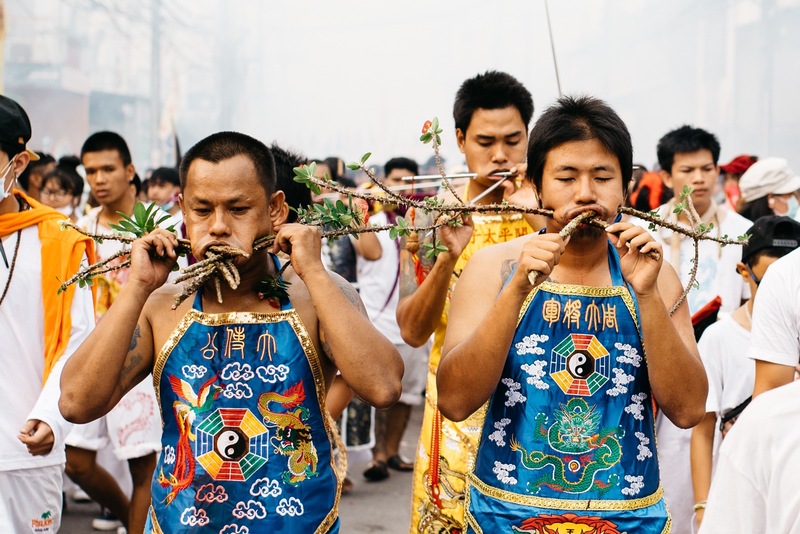 In China, Taoists traditionally believed that the Nine Emperor Gods were the individual stars of the Big Dipper plus two smaller neighboring stars who descended to earth to bring healing waters (i.e., rain). 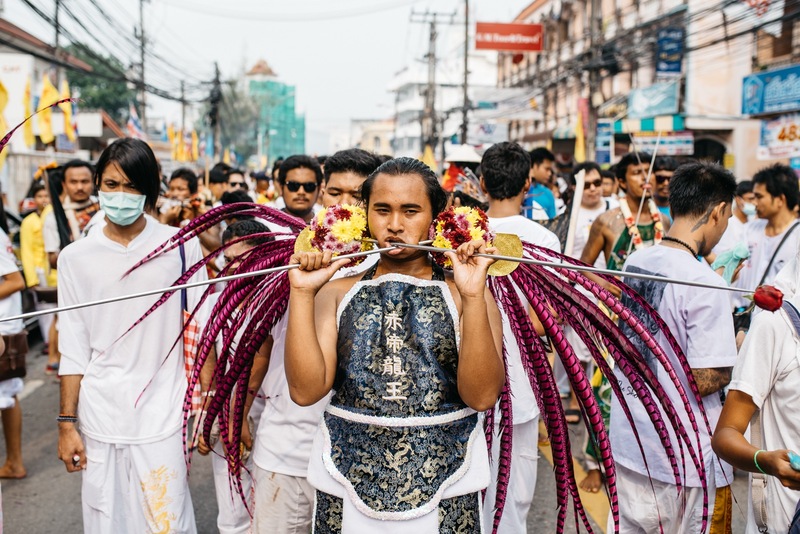 Celebrants wear white, light incense, ring prayer bells and parade in honor of the deities’ arrival. 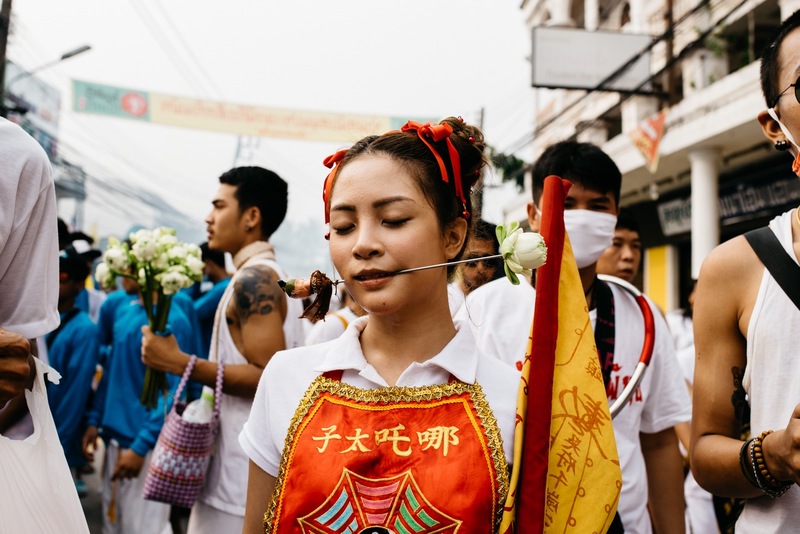 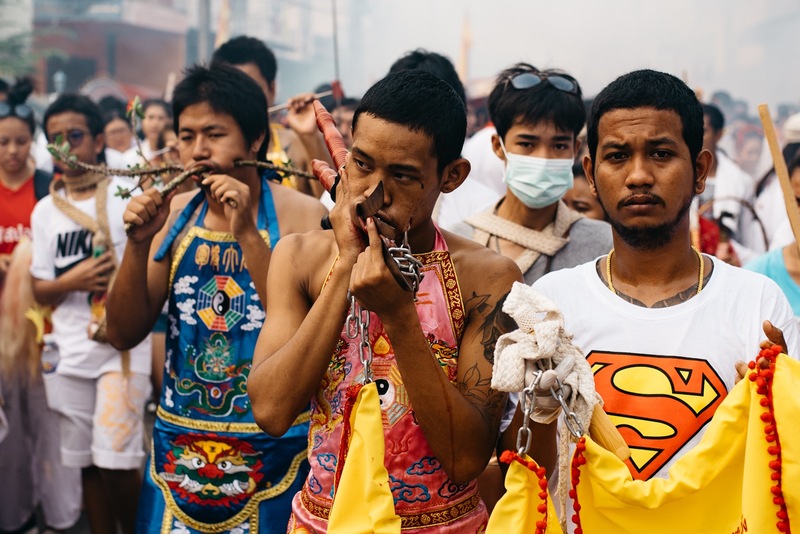 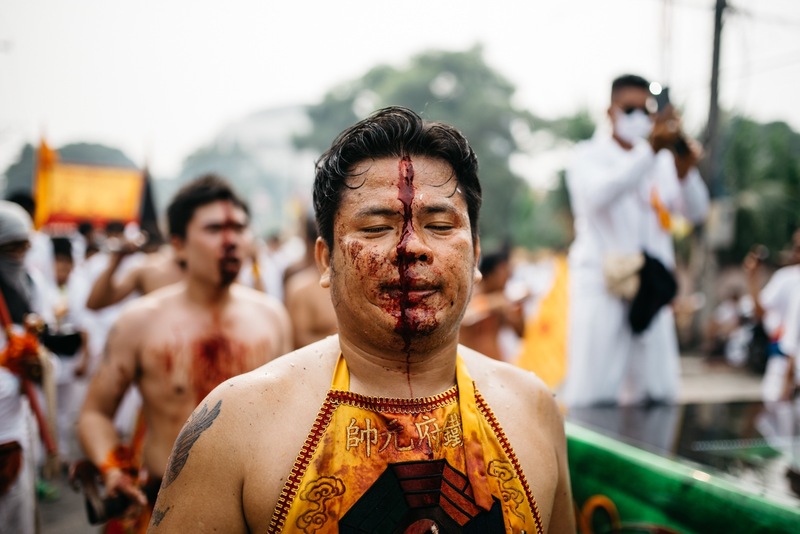 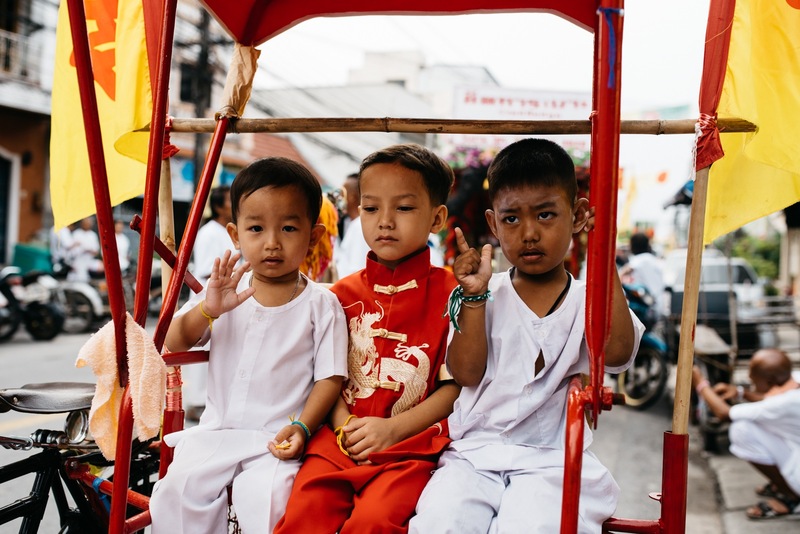 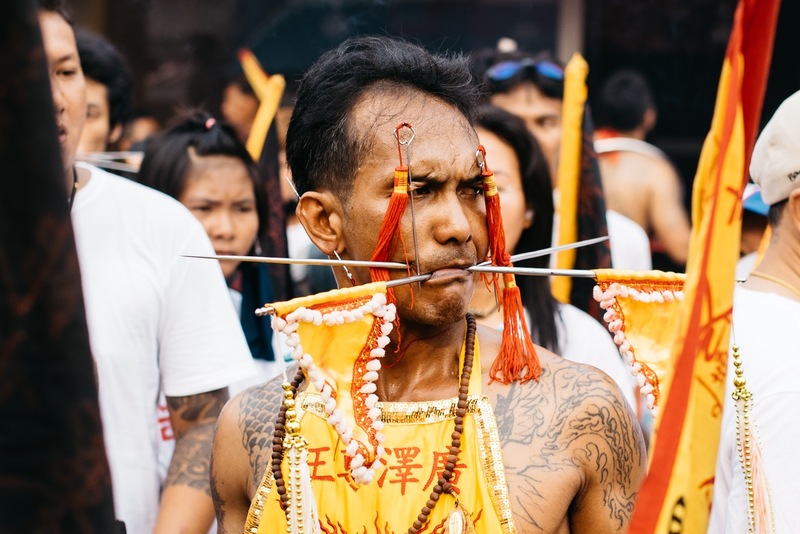 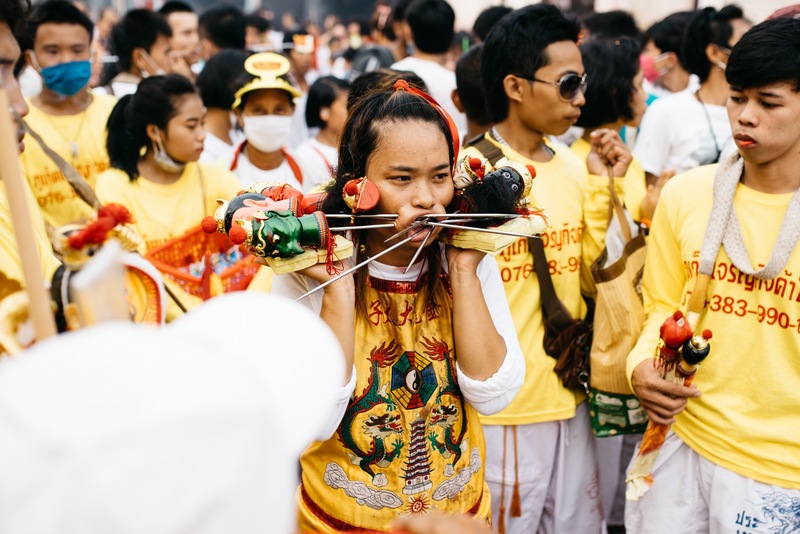 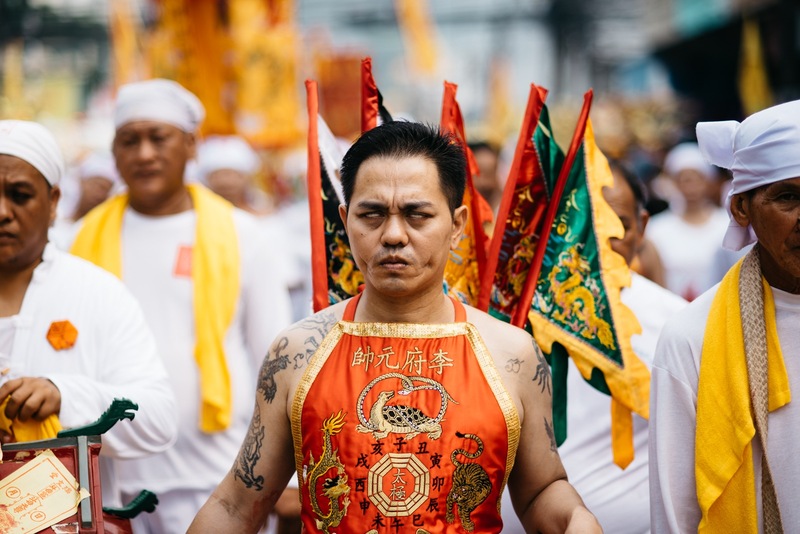 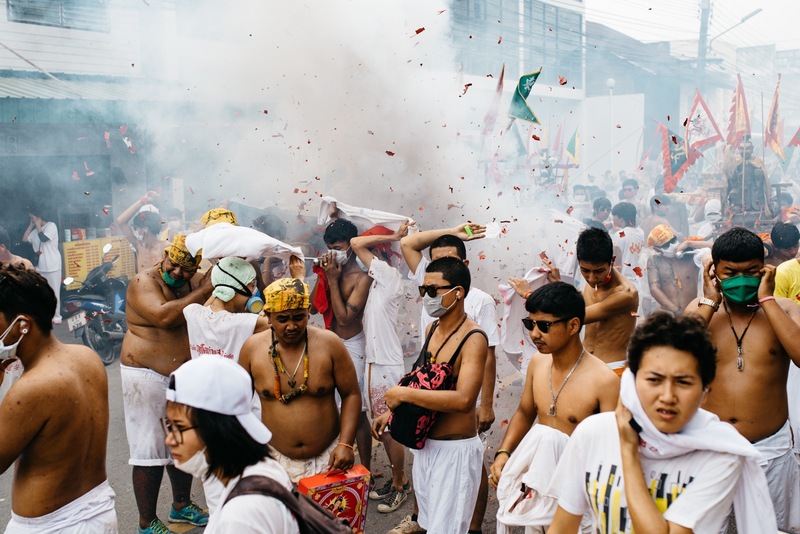 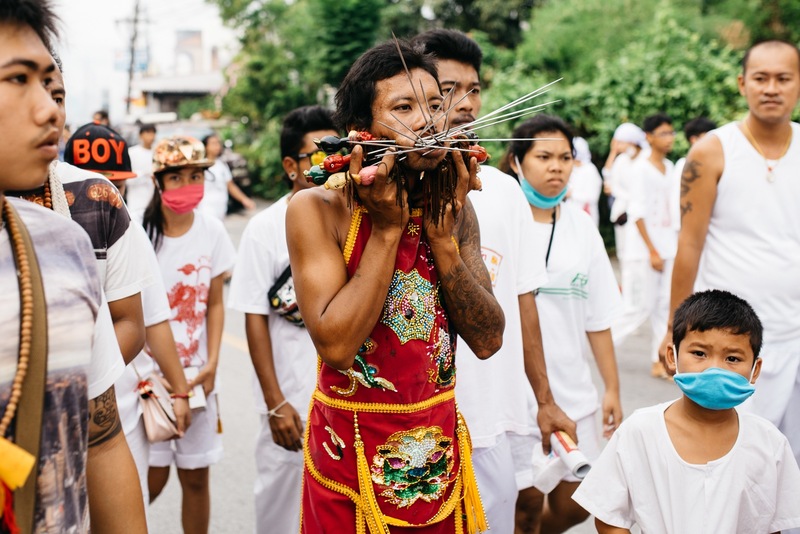 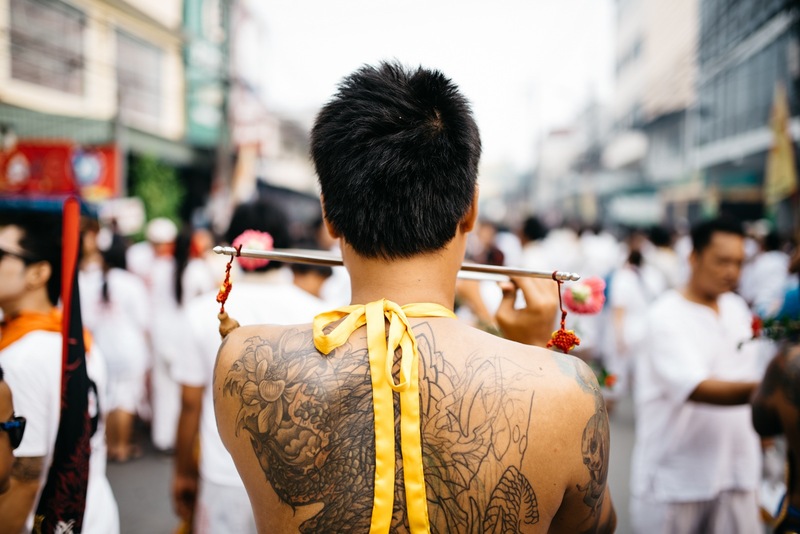 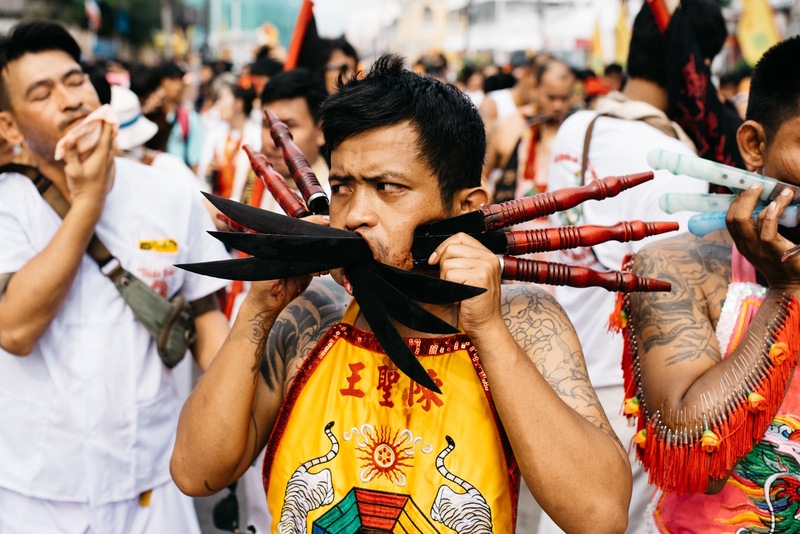 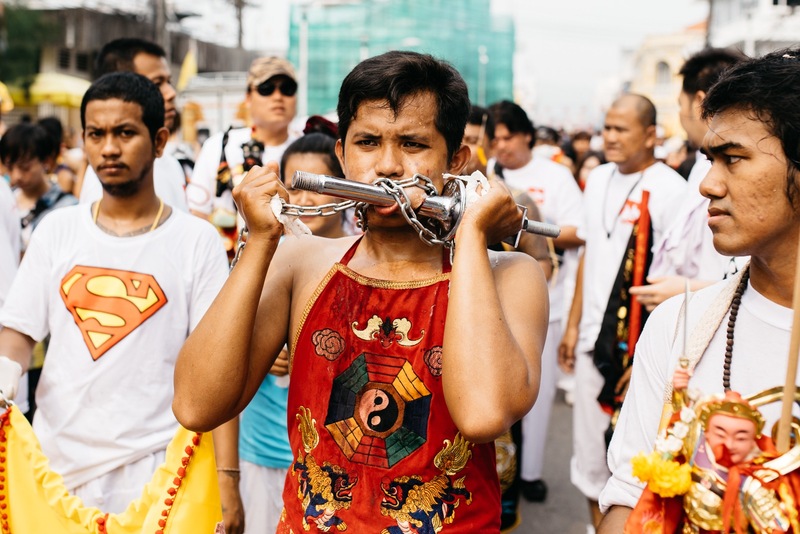 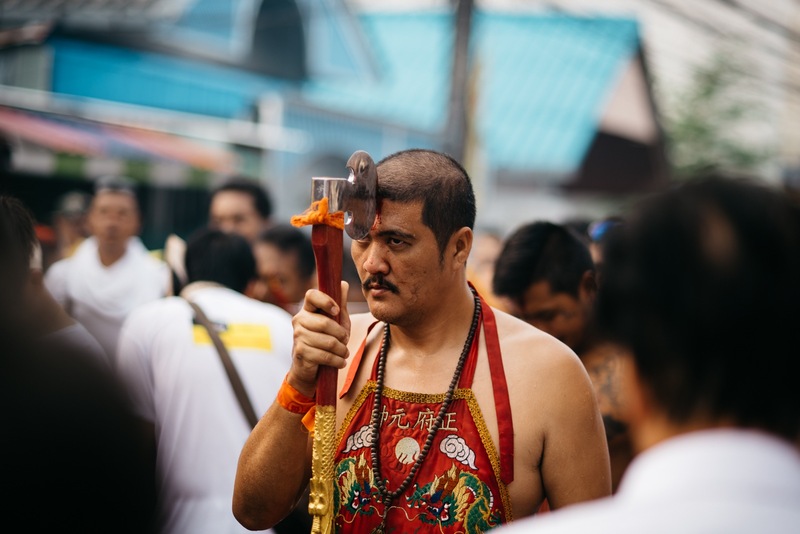 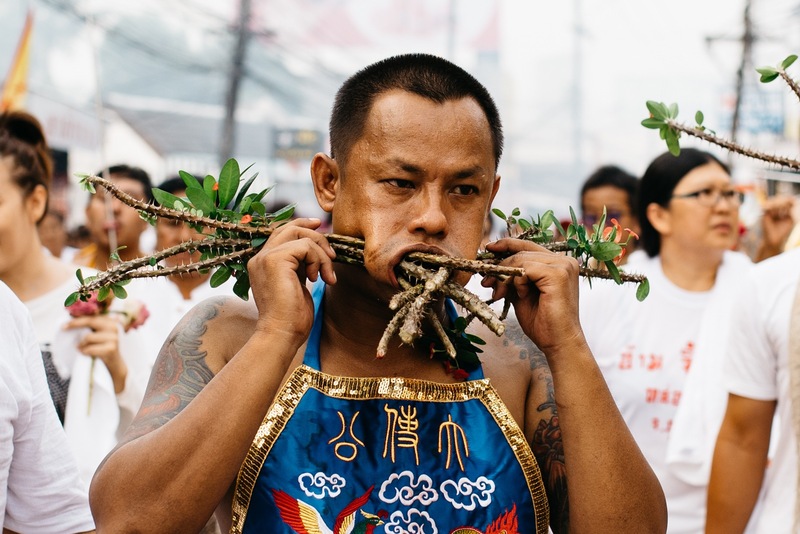 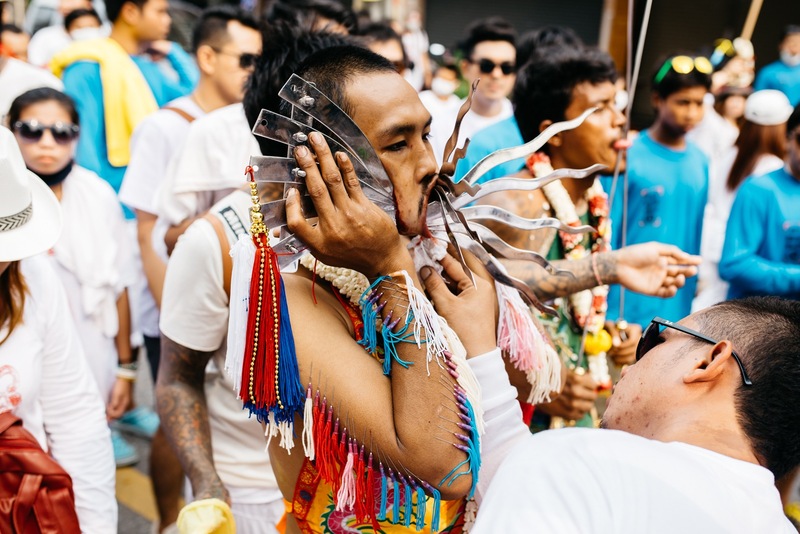 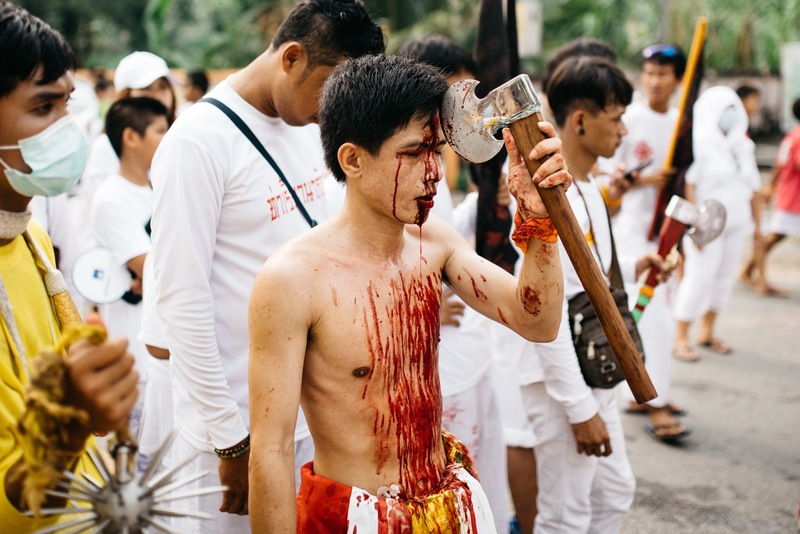 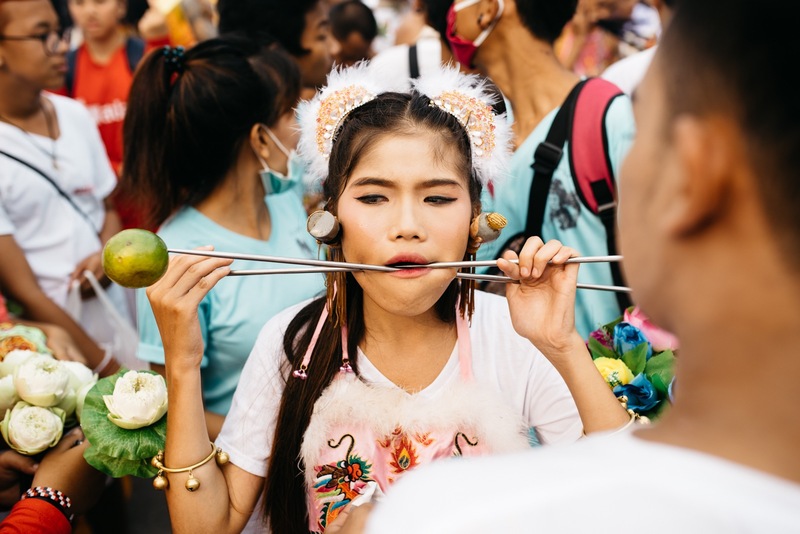 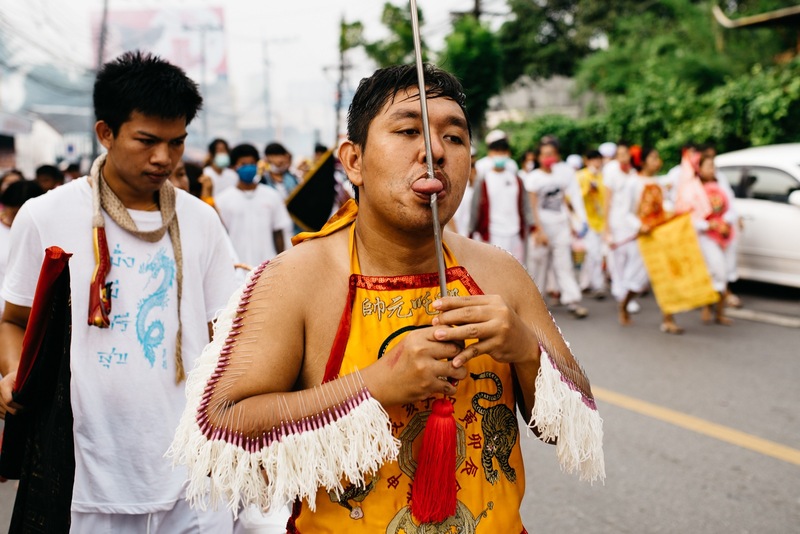 The Phuket Vegetarian Festival is a nine-day commitment to abstinence and purity, where participants display devotion to the gods in a truly gruesome fashion. 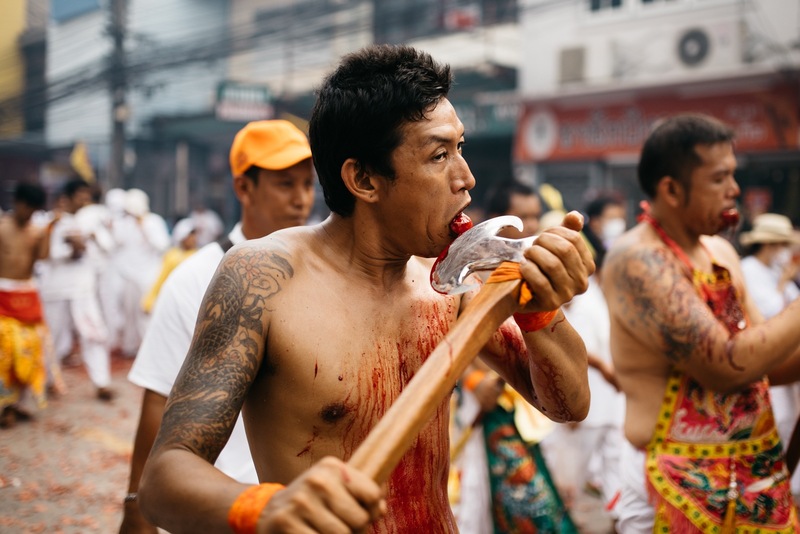 The thing I found the hardest to watch were the groups (mostly four or five people associated with one shrine) cutting their tongues and foreheads. 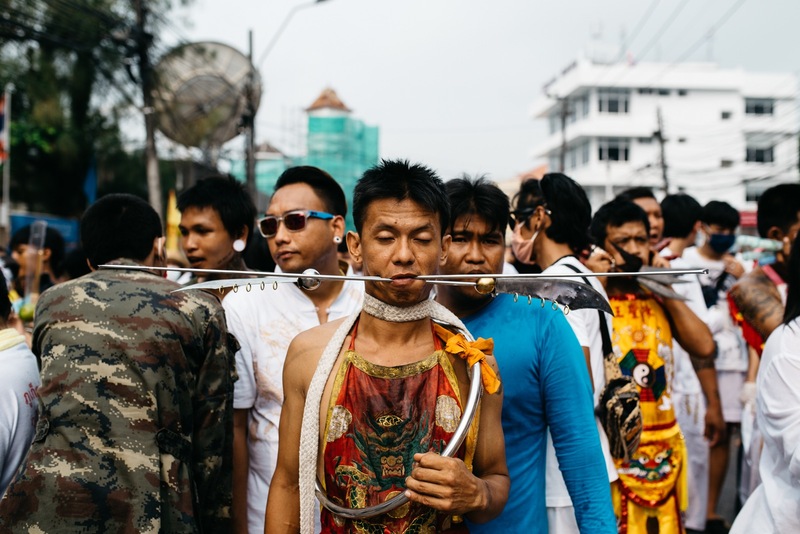 At certain junctions they would stop, form a circle, tap each others' axes, and then start chopping into their own backs. 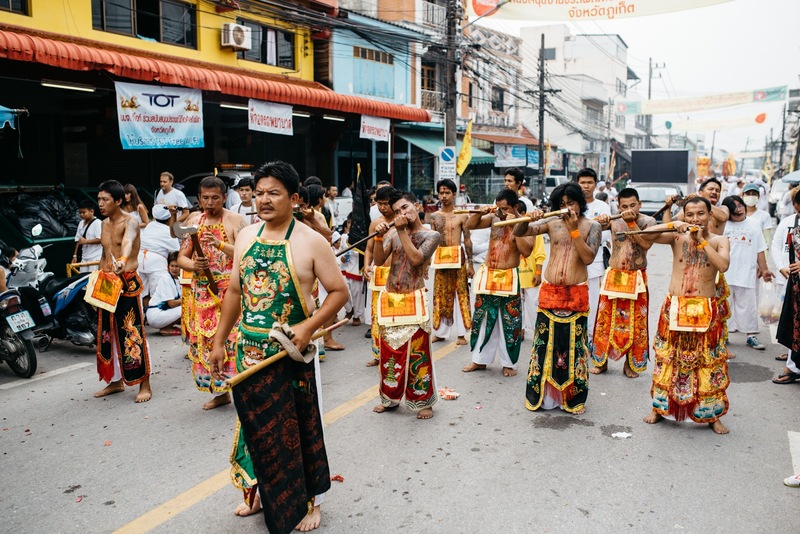 On the other hand, it was impressive to see all the Thais watching the parade, and praying (doing the "wai") to the mah song when they pass by. 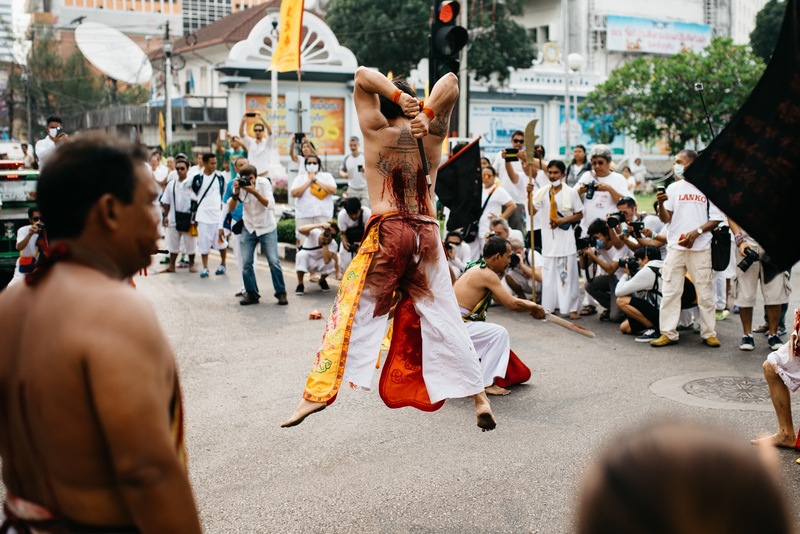 A man with 20 blades jutting through his body, blood cascading down his white shirt is a stark sight for even the least faint of heart. 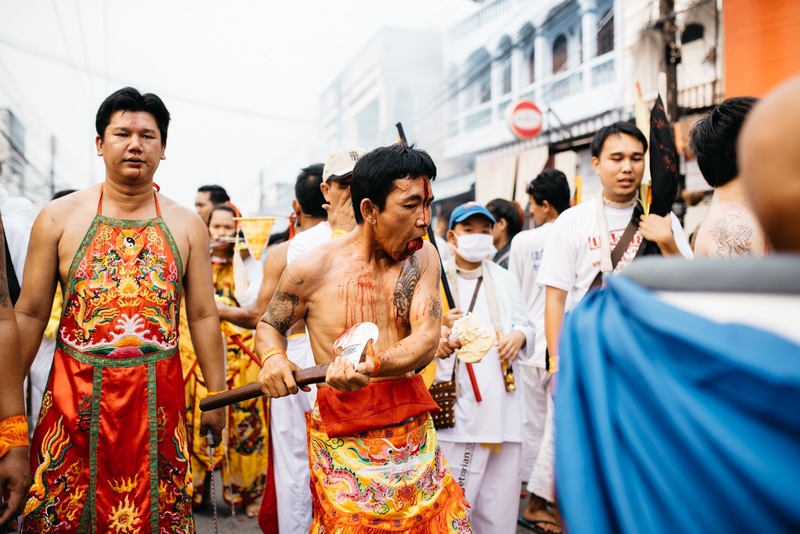 Perhaps miraculously, both scarrings and deaths are rare once the Vegetarian Festival has ended. 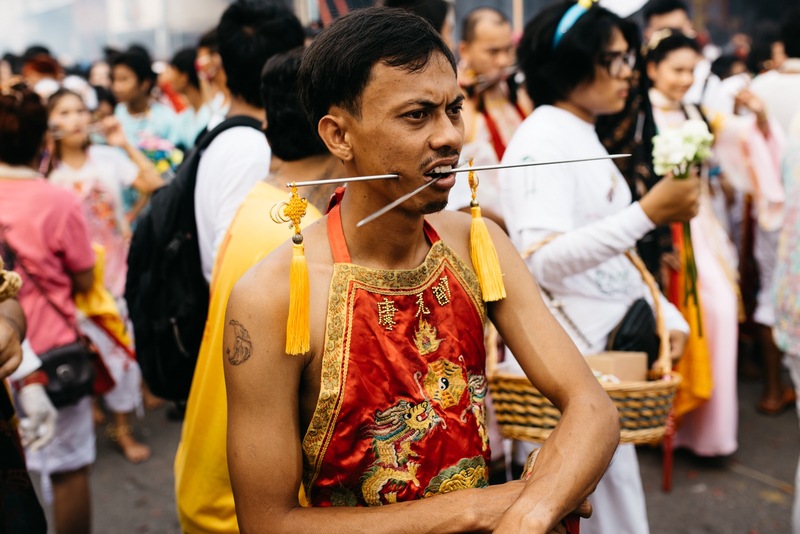 The photos below are not safe for work (NSFW).